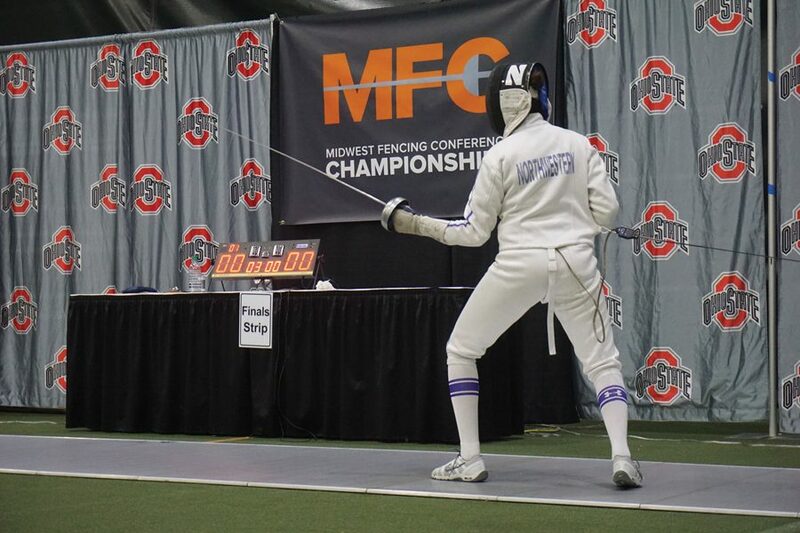 A Northwestern fencer toes the strip. Emine Yücel, Yvonne Chart and Sarah Filby have all done that for their national teams so far this season. The 2017-18 season has been a banner campaign for Northwestern. The Wildcats won 47 bouts during the regular season and 25 in a row at one point, both highs in team history. They followed that up with a Midwest Fencing Conference championship, only the fifth in team history and the second in three years. But for a few fencers, helping NU to one of its best seasons ever was not the only priority during the season. Junior foil Yvonne Chart, freshman foil Sarah Filby and senior sabre Emine Yücel all competed internationally in hopes of achieving success beyond the college scene during Northwestern’s regular season. Chart represents Great Britain, Filby represents Canada and Yücel represents Turkey. All three have traversed the globe, from Tauberbischofsheim, Germany, to Tashkent, Uzbekistan, to compete at the highest level at World Cups, Grand Prix and Junior National Championships during their international careers. And, with major events coming in the near future, each is trying to accomplish goals for both club and country. Each fencer’s career in the sport started differently. Filby and Chart both started fencing at early ages. At Chart’s first-ever fencing class, she broke down after misunderstanding a joke. The coach then took about five minutes to calm Chart down and explain that, even though she had not seen the movie, she could still fence. Chart, who was born in Australia and lived in Texas and Washington, D.C. before settling in England, did not start to participate in competitive events until she moved across the pond. For Filby and fencing, it was not love at first sight. “When I was little, when I went to tournaments my parents would have to buy me Webkinz for every touch I got to keep me motivated,” Filby said, referencing the stuffed animals once popular among pre-teens. She almost quit when she was 10, but her parents and coaches made her stick with the sport. The decision to continue proved to be important, as she started to enjoy it soon after. As for Yücel, her parents did not let her start fencing until she started high school. But once she did, she picked up the sport quickly and was soon competing at national-level events. By the time all three were in the latter half of their high school careers, fencing was a major part of their lives. They were all traveling to competitions across the world and dedicating a great portion of their time to fencing. Filby even transferred to a Canadian boarding school for her junior year to work with her national team coach. While the trio came from different backgrounds, they all eventually made their way to Northwestern. Last October, both Chart and Filby competed at a Foil World Cup event in Cancun. While they had competed at the same event previously, this was the first time they attended a competition as college teammates. In 2015, Chart and Filby attended a World Cup event in Guatemala and both had their best-ever international tournament finishes there. Chart won the bronze medal, while Filby secured the gold. Though Chart’s finish was noteworthy, what stuck with her was the atmosphere. She was the only fencer from Great Britain at the event, but her cordiality with the Guatemalan fans gained her a following. On her way to the championship, Filby faced Chart in the semifinals. While there is no tension between the two over the bout, it is memorable not for the result, but what happened during the bout. Yücel’s international experience has been far from normal. Very soon after starting fencing, she made her first national training camp. Those camps were the basis for how fencers were selected for national teams. In her last two years of high school, Yücel said she made many trips across Europe to compete at different international tournaments. But now, Yücel’s relationship with the Turkish national team is in a much different state. “I don’t really have a relationship because I’m mostly here, and they don’t really like that I’m here because that means that I can’t work with them, and I can’t go to the camps,” Yücel said. Yücel said a new coach took over a few years ago and prefers working with fencers in Turkey. This is something Yücel, who only returns to her home country for national competitions, cannot do. As a result, Yücel said the geographic difference between Evanston and Turkey has created a wedge between her and the team. Even with these issues, Yücel is trying to keep a dialogue with her country’s top officials. Yücel, who dealt with injuries early in her college career that prevented her competing internationally, returned to the international field in January at a Baltimore World Cup event. She struggled in her return to the international stage, but despite the troubles, Yücel continues to push forward with one goal on her mind: the Olympics. Fencing is one of the original Summer Olympic sports. Women’s fencing, specifically the foil event, joined the Olympic program at the 1924 Games in Paris. At the upcoming 2020 Olympics in Tokyo, there will be six women’s fencing events on the program: individual and team competitions in epee, foil and sabre, the most in Olympic history. With July 25, 2020, the first day of fencing in Tokyo, less than 900 days away, the 2020 Games are on the minds of all three fencers. For Filby, who a few weeks ago qualified for the Junior World Championships in Italy, making the Olympics is not high on her list of priorities. While she said she would take the opportunity if it was ever presented to her, she is not “actively” pursuing it. Instead, Filby hopes for a different Olympic goal. Chart and Yücel, meanwhile, are both actively trying to earn their way onto the strip in Tokyo. Chart, who was in the crowd for the 2012 Games in London, believes that her year in school is beneficial to her goal of making the team. After she graduates in 2019, she hopes to spend the year leading up to the Olympics preparing for Tokyo. Both fencers said competing in the Olympics would mean a great deal to them. Yücel said that it is all she has ever wanted since she first picked up a sabre and that she will do whatever she must to qualify for the Olympics.